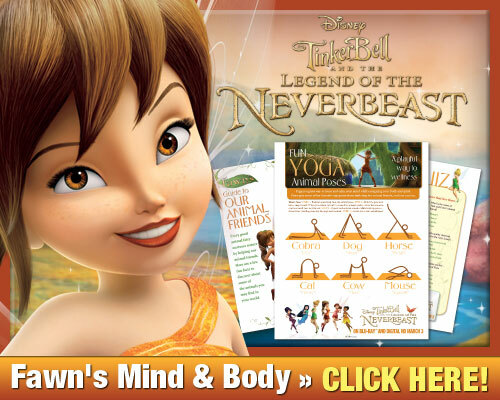 Tinkerbell and the Legend of the Neverbeast Movie was whimsical, fun, dangerous and scary all at the same time. Growing up I was a huge Peter Pan fan and through the years I’ve watched all of the Tinkerbell movies. I would have to say that Tinkerbell is still one of my all time favorite Disney characters but after seeing Tinkerbell and the Legend of the Neverbeast she has another contender! Fawn is an animal loving fairy who sees the best in things but doesn’t always think with her head. Fawn is a 5 inch star of Tinkerbell and the Legend of the Neverbeast along with Gruff who is portrayed as the “bad” guy if you will. But in the end the bad guy isn’t so bad after all because he saves Pixie Hollow. The Disney animators, writers and voice over actresses and actors all did a phenomenal job creating this addition to the fairy family. Balancing your heart with your head, not judging a book by it’s cover and of course be a valuable team player. But most importantly it is to follow one’s heart and be balanced with the people around you as well. So be sure and pick up your copy of this Blu-Ray and DVD on March 3rd! I promise you and your kids will fall in love with Fawn, Gruff and of course all of the other fairies in Tinkerbell and the Legend of the Neverbeast!